Set foot on the moon. Leave your footprint. Plant your flag. Fire up your lunar rover for a joyride. It will be one small leap for man, one giant leap for party people! Okay, okay, you're not going to the moon. (Probably.) 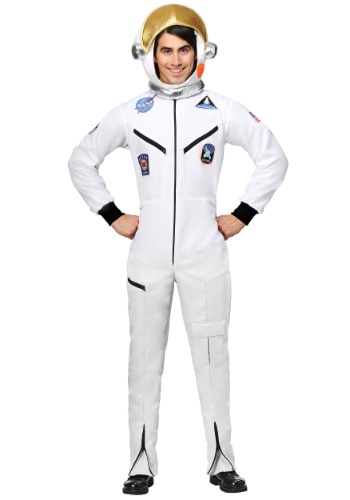 But that is no reason not to party like an astronaut with this Adult Plus Size White Astronaut Costume. A HalloweenCostumes.com exclusive, this style is going to have you feeling ready to step foot on the moon. Hey, you never know... maybe you'll find a big party up there too! In zero gravity or right here on planet Earth, when you grab this costume, you'll be able to have a great time at the get-together. This White Astronaut Costume is styled as a one-piece jumpsuit (with the pictured helmet and accessories sold separately). Rib-knit cuffs and ankle zippers make the jumpsuit functional but also comfortable and easy-to-wear, and the realistic patches will make it look like you're official NASA brethren. We made and designed this costume right here in our own costume studios, and made it so that no matter where you wear it, you're going to command the respect of others as a space pioneer and explorer. In plus sizes 2X to 4X, it's sure to have you ready for your mission. Blast off time!